Don’t put yourself or your employees at risk of back injury or muscle strain ever again. And it’s sanitary, too: You don’t have to touch the toilet itself. 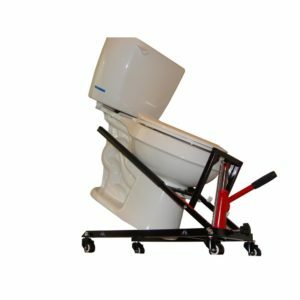 The Toilet Jack helps eliminate the water mess by reducing the risk of water spilling over the p-trap as it tilts water away from the toilet base opening. With the Toilet Master Jack, the toilet is never placed down on the floor so there is no wax mess to clean up. No more struggling for a place to put the toilet. It stays on the jack through the entire process! Easy to maneuver, the Toilet Jack rolls the toilet out of your way and then back into place over the closet flange once you are ready to install. Don’t fight, guess or hope you align the toilet and flange bolts correctly. The Toilet Jack aligns the toilet, lowers the toilet in place, and inserts the bolts–problem-free the first time. Every time, a perfect alignment and perfect bolt installation. (Alignment tubes go through toilet base slots and over the bolts to insert them). 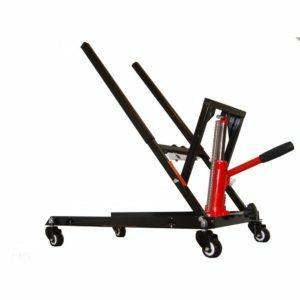 The Toilet Jack is designed to work with floor or wall mount toilets and allows you to change a wax seal in 10 minutes or less. Just jack it up! Remove old seal. Position new seal. Align it and lower it. That’s it. You’re done. Fast, Easy, No Problem. (No wasting wax seals, no fighting the bolts). 4 swivel casters — easy to maneuver! Call, email, text or Skype Duff Co. to order yours today!